What if you knew of an all natural cancer clinic that has survived in the USA for nine years with a very high rate of remission and recovery rates? There is one in Tempe, Arizona. It’s called NatureWorksBest Cancer Clinic. Cancer patients come to that clinic after they’ve been diagnosed with cancer from conventional oncologists. There are some USA “integrative” cancer clinics and hospitals that offer natural treatments to mostly support cancer patients through orthodox oncology procedures. 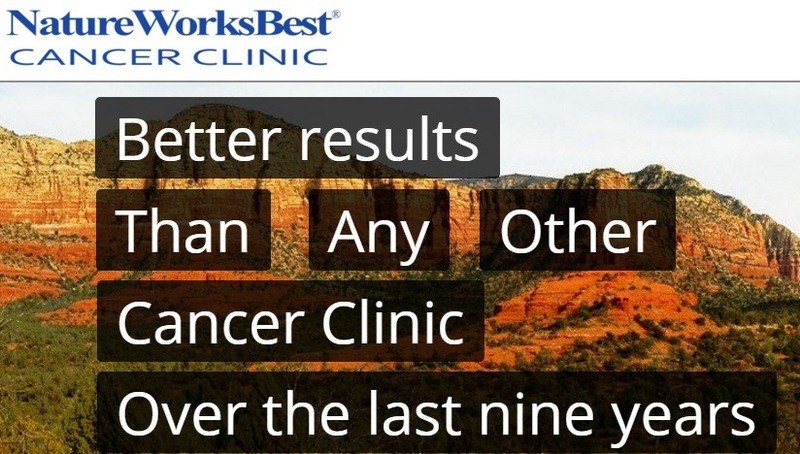 But the NatureWorksBest cancer clinic does not use chemotherapy, radiation therapy, or surgery at all while using state of the art diagnostic methods to determine patients’ progress. Dr. Colleen Huber recorded 397 of her clinic’s patient histories from start to finish up to 2015, including those who left early, did chemotherapy, radiation and surgery, and refused to comply with her dietary recommendations. Only a few died while under her clinic’s care. How has this clinic been able to avoid being prosecuted by the drug Industry (read FDA) and the main stream medical establishment for using a non-protocol treatment method. If they are able to provide this treatment without the FDA on their case, why are there not other clinics established providing the same treatment methods? It has to do with the State laws in Arizona. Arizona allows certain naturopathic doctors (in addition to "medical" doctors) to be licensed to practice medicine, so they can legally prescribe treatments that help their patients. I would like to know how they manage to do these natural treatments without the mainstream medical authorities and drug companies (read FDA) prosecuting them for not following allowed cancer treatments? So happy to hear about your clinic. You are doing great work by spreading the news about cancer treatment alternatives. Also grateful to hear about the mammogram issue. Thank you.